Monasteries had special services everyday in which the dead of the community were commemorated. It took place in the chapterhouse after morning prayers or mass and consisted of reading aloud in turns a chapter from the rule followed by the community, the names of saints whose feasts would be commemorated on the following day and reading of the names of the deceased of the community and names of important friends who had given them support. The lists of names of saints and of the dead along with a calendar and other texts important to the monastery, such as its rule, were collected in a book called a 'martyrology.' 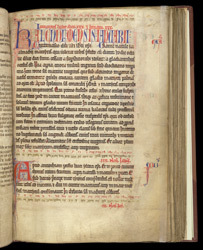 A very old, large and important community such as the priory of Christ Church, Canterbury, would have a massive list and collection of texts important to it. This martyrology of Christ Church records names and events from the 14th to 16th centuries. The martyrology includes the lives of saints for each day of each month. This page opens the month of January with the story of St Almachius, an early Christian martyr who was killed in the gladiatorial games after he complained about pagan idols. His story is told in the 'Roman martyrology', from which this account was copied. For 2 January, the story of the martyrs Marcellinus and Narcissus, who were killed near the Black Sea about 320, was read. The saints' stories would have been read on their days.